Hotel la Ferme d'Augustin****, Saint Tropez, Tahiti Beach, Cote d'Azur, Provence, France - GourmetVoyageurs.com - Upscale Food and Travel eMagazine. "La Ferme d'Augustin**** is a lovely hotel converted from an old family farm and, very recently, beautifully remodeled in great good taste with charming individually decorated rooms and suites and some of the nicest and well thought out functional bathrooms we have encountered. In addition, it is just a 5 minutes walk from the famousTahiti Beach and a short shuttle ride from the boat harbor and down town St. Tropez, Cote d'Azur, France. Tucked away in a quiet area of the St. Tropez region's country side and just a stone's throw from the famous "Tahiti Beach" (actually only about 5 minutes walk from the hotel), lies the charming hotel, the four star family owned and operated "La Ferme d'Augustin", a real oasis of peace and calm; a perfect place to settle in for a vacation with both the beach and the hotel's own lovely pool area at hand and yet the delights of St. Tropez just a few minutes ride by car or by the hotel's shuttle. A perfect spot on France's Cote d'Azur. 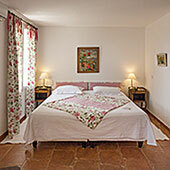 The hotel was once the Augustin family's farm. During the 1950's, M. and Mme, Augustin opened their ancient farm to a few guests who had come for the beach and did not want to leave it. Today, the original farm buildings have been enlarged and extended at the same time retaining all the informal and relaxed family feeling they began with. A lovely modern pool with a water massage, nooks and crannies for sun bathing or shade for a nap or reading a book abound. There are stone pathways weaving their way through the property and the sound of the birds prevails with the scent of the salt water sea on the air along with whiffs of the pines and wild herbs. All of the forty six rooms and suites, that are spread around the property in the main building and in the annexes, have been completely renovated very recently and all are absolutely charming; each with their own interior design character that has made use of the old beamed ceilings and centuries of additions. The fabrics are Provencal, but far from the usual stuff. These are light designer versions of traditional themes that marry the past with the present. The Mediterranean influence is felt through out in the lovely period furnishings and paintings. There is a sophisticated country simplicity to all the rooms and the well appointed bathrooms that is extremely appealing. In the main building there is an elevator for those for whom stairs present a problem. The "Ferme" is still in the business of food production although today in a smaller way. From their hillside vineyards and olive groves, they produce their own wine and olive oil on the nearby property of the gracious owner. The family has a passion for the land and their products and a great love of the region. The olives are picked slightly before maturing, cold pressed and non-filtered which produces an oil both flavorful and light. On the hotel property there is a kitchen garden that produces much of their "garden to plate" food stuffs including a great variety of tomatoes, lettuce and fresh herbs side by side with courgette and aubergines (eggplant). The kitchen staff can often be seen picking just before the next meal. The grounds are filled with an abundance of flowers everywhere and the air is spiced with that unmistakable aroma of the Umbrella Pines. M. Christophe Vallet, the son and director of the hotel, commissioned a line of very special room sprays, soaps, bath and shower gels and more with a most unique and superb aroma. He commissioned one of France's preeminent perfume designers to create this collection. They are available exclusively for the guests. We admit to loving the scent and came away with a selection of products to bring home to our endless delight. The cuisine is good, unpretentious country cooking using the products and flavors of Provence, much of which comes from their own gardens as noted above. The family has bonds with other farming families in the area that go back generations and extend to local fishermen and meat, poultry and dairy producers as well. Food is prepared fresh daily according to both the fisherman's catch of the day and the yield from the gardens as well as supplements from a few leading local suppliers. These are authentic, simply prepared dishes infused used with Mediterranean flavors and fragrances. 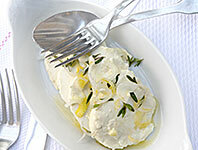 I enjoyed a plate of raw fennel, sliced with Parmesan dressed in olive oil and lemon. Peter's sardines in olive oil arrived with a rustic salad of butter lettuce, onions accompanied with a side dish of fresh goat cheese (a house specialty). This could be improved on with a lighter touch as could my herb crusted lamb chops. 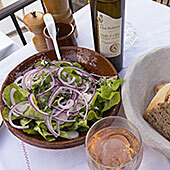 The meal was served with their own lovely Rosé and olive oil for the crusty country breads from the local boulangerie. Peter tried the house specialty dessert of a mountain of whipped cream and soft meringue powdered with chocolate was even he found over the top and could not finish. The plate of fresh strawberries I ordered made a pleasantly refreshing summer dessert. Over all when it comes to the cuisine, our suggestion would be to stay with the daily menu posted on the "black board" which reflects the market of the moment rather than ordering from the à la carte menu. We were not offered this option and were well into our meal before we realized that others were ordering the daily specials. This is not, nor intended to be "haute cuisine" and is not expected to be by the clientele. A nice touch is the "no set schedule for meals" flexible program. Breakfast is served until early afternoon, so sleeping late or enjoying a leisurely walk or jog on the beach before eating is possible making the freshly squeezed orange juice and home-made water melon jam even more welcome. Fax : + 33 (0)4 94 97 59 76. Member of "Authentic Hotels & Authentic Cruises"